9. 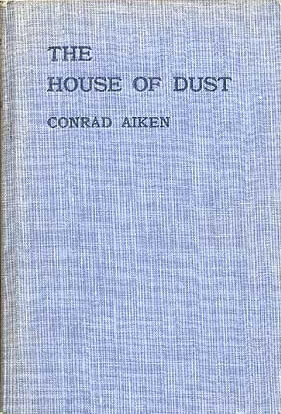 The House of Dust: A Symphony. Boston: Four Seas, 1920. The fourth of Aiken’s ‘symphonies’ (see also 3a and 15), composed in 1916 and 1917. A book-length poem divided into four parts, the first two of which evoke an ominous and impersonal city, the latter two, in a series of vignettes, seemingly unrelated characters set against the cityscape. Two sections make use of ukiyoe. In both, the prints are seen through the eyes of a woman who herself is observed by a man who is silent but for his internal monologue about her, the lines ‘spoken’ in the poem. In both, as well, as in a later Aiken poem (12), the characters see the tranquil world depicted in the prints in contrast to their own world and its complications. Neither print is identifiable from details provided. The unifying principle for these works derives from the orchestral metaphor, but one is reminded as well of Pound’s comments about a ‘long vorticist poem’, which like ‘the best “Noh” . . . is gathered about one image . . . enforced by movement and music’ (see BK12). No definitive connection may be drawn from the published record, but Aiken would have known of Pound’s article. Here similar and recurring images of the impersonal city provide a centre around which the world of the poem revolves. Part III, section XI is a reprint with slight emendations of Conversations: Undertones (8). Reprinted, with revisions, in The Divine Pilgrim (15) and Collected Poems (17), in both cases along with Aiken’s other ‘symphonies’ in a connected sequence, which according to the preface of Divine Pilgrim had been intended from as early as 1915.
a. The Screen Maiden (Part III, section II). A note at the beginning says that Aiken is ‘indebted to Lafcadio Hearn [D9] for the episode called “The Screen Maiden” in Part II’, but the 114-line section indebted to Hearn is in fact in Part III. The episode is framed by lines that reveal it to be a passage from a book, presumably Hearn’s, being read by a woman as she is watched by the speaker, the ‘I’ character, from a window. In the tale she reads, ‘Tokkei’, a Japanese poet grief-stricken because of the death of his lover, finds a portrait of a young woman by ‘Hiroshigi’ (Hiroshige, Ap) and falls in love with the image. He learns sometime later that Hiroshige’s talent was so great that when the subject of one of his works dies the spirit may ‘[enter] the portrait wholly’. Tokkei appeals to the image and slowly it comes to life. Aiken’s incomplete knowledge of ukiyoe at this date is indicated not only by his misspelling of Hiroshige—he has it right by 1928, in 11—but also by the fact that he has the nineteenth-century artist ‘many centuries dead’.